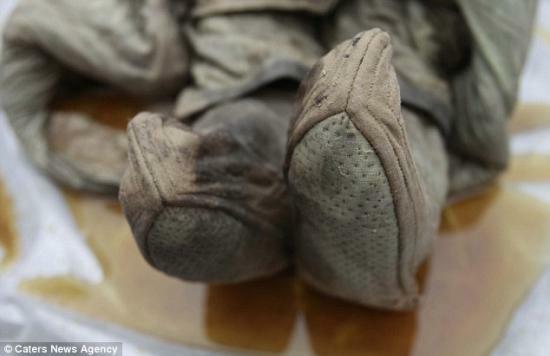 These incredible pictures show a 700-year-old mummy, which was discovered by chance - by road workers - in excellent condition in eastern China. 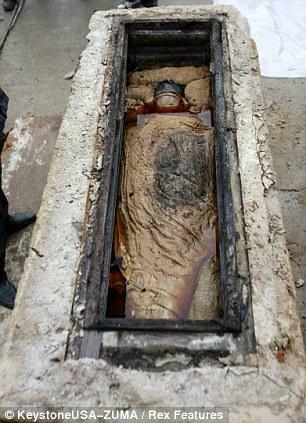 The corpse of the high-ranking woman believed to be from the Ming Dynasty - the ruling power in China between 1368 and 1644 - was stumbled across by a team who were looking to expand a street. And the mummy, which was found in the city of Taizhou, in the Jiangsu Province, along with two other wooden tombs, offers a fascinating insight into life as it was back then. Discovered two metres below the road surface, the woman's features - from her head to her shoes - have retained their original condition, and have hardly deteriorated. 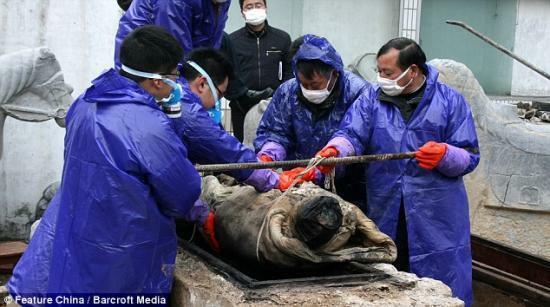 When the discovery was made by the road workers, late last month, Chinese archaeologists, from the nearby Museum of Taizhou, were called into excavate the area.They were surprised by the remarkably good condition of the woman's skin, hair, eyelashes and face. It was as though she had only recently died. Her body, which measures 1.5 metres high, was found at the construction site immersed in a brown liquid inside the coffin. And the coffin was opened earlier this week, on March 1, much to the excitement of the local city - and further afield. 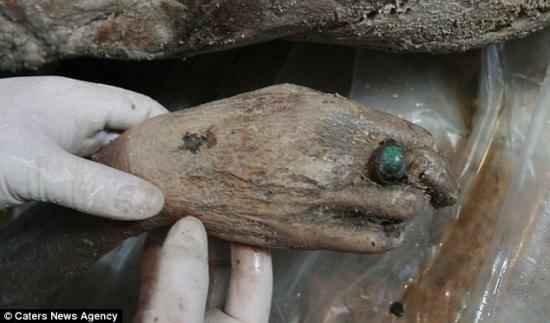 And the right hand of the 700-year-old mummy showed her preserved skin, and a ring. 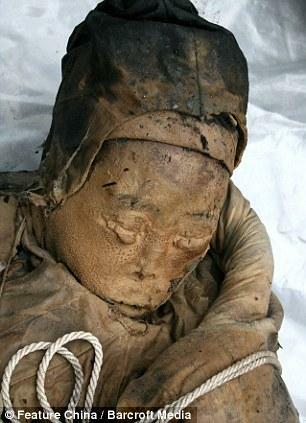 The mummy was wearing traditional Ming dynasty costume, and also in the coffin were bones, ceramics, ancient writings and other relics. This is the latest discovery after a lull of three years in the area. Indeed, between 1979 and 2008 five mummies were found, all in very good condition. Those findings raising the interest in learning the techniques of preservation funeral of this dynasty and customs in time to bury the dead. 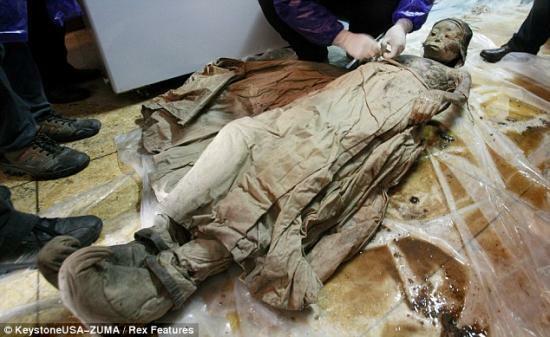 Director of the Museum of Taizhou, Wang Weiyin, told Xinhua that the mummy's clothes are made mostly of silk, with a little cotton. He said usually silk and cotton are very hard to preserve and excavations found that this mummifying technology was used only at very high-profile funerals. The first finding of the Ming Dynasty in Taizhou dates from May 1979 and led the opening of the museum. 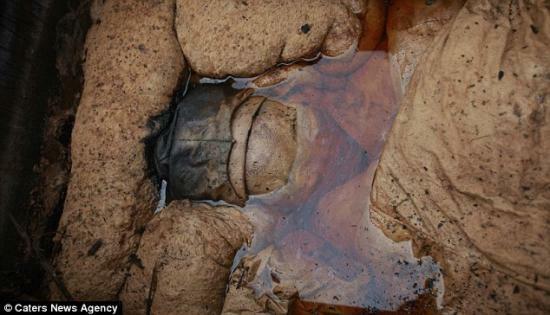 At that time the bodies were also found intact, but due to lack of experience of archaeologists only clothing, belts and clamps could be preserved. The Ming Dynasty, who built the Forbidden City and restored the Great Wall, was the last in China and marked an era of economic growth and cultural splendour which produced the first commercial contacts with the West.